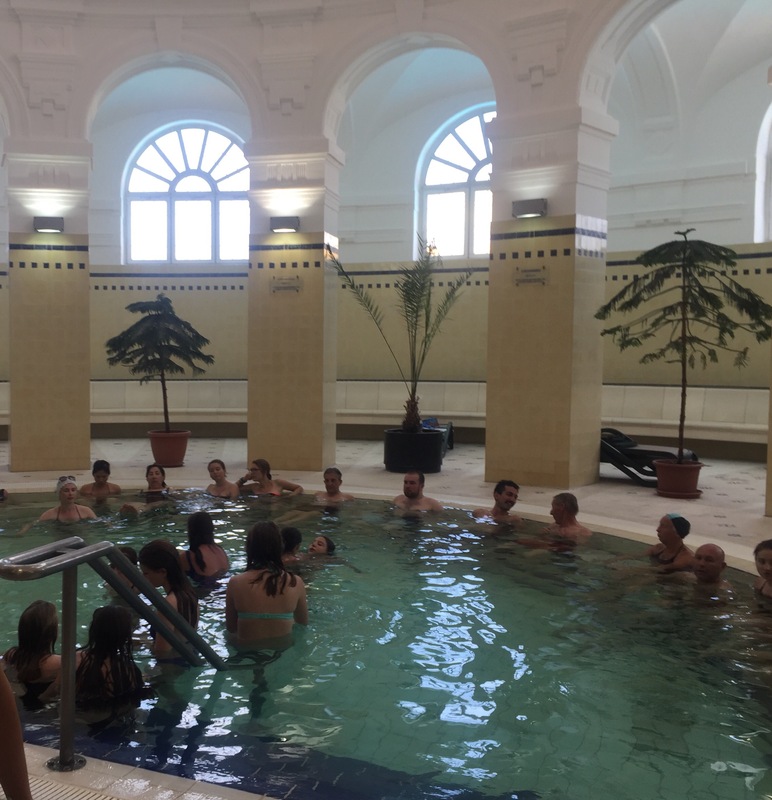 This time we chose Szechenyi Spa in City Park. Another great park. This one equally as large and lovely as Margaret Island Park. . We arrived on the bus no 105 at a huge square or Piazza with amazing statues. We entered the park and passed a pool where the FINA ynchronised wimming was taking place. We could tell by the loud music echoing across the park. Then a castle. A large one. So fairytale like, I was entranced. 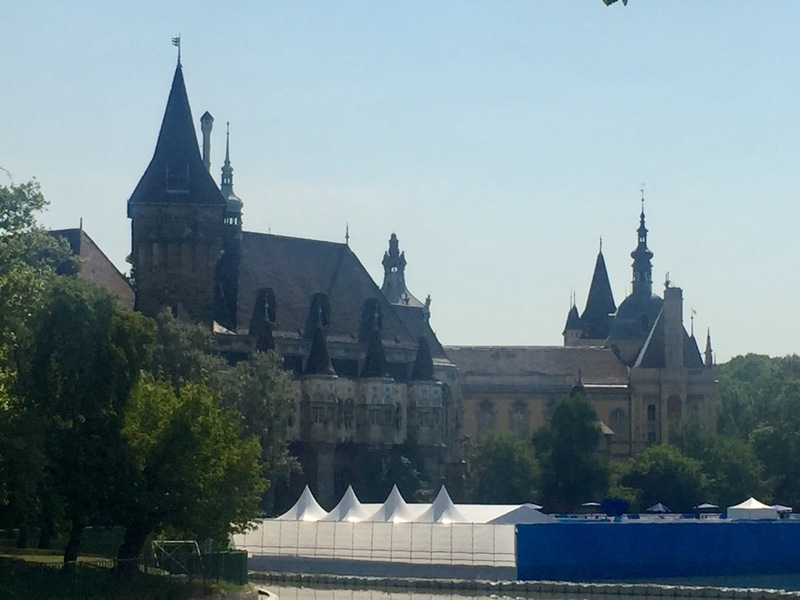 It was Vajdahonyad Castle built in 1896. So romantic. It overlooks what is usually an ice skating rink in winter but now home the synchronised swimming! We kept walking along paths past beautiful fields with large trees, people sunbaking, children playing, dogs and their owners romping , tennis courts, skate board park, a zoo and finally the Spa. It is amazing. It looks like a castle! 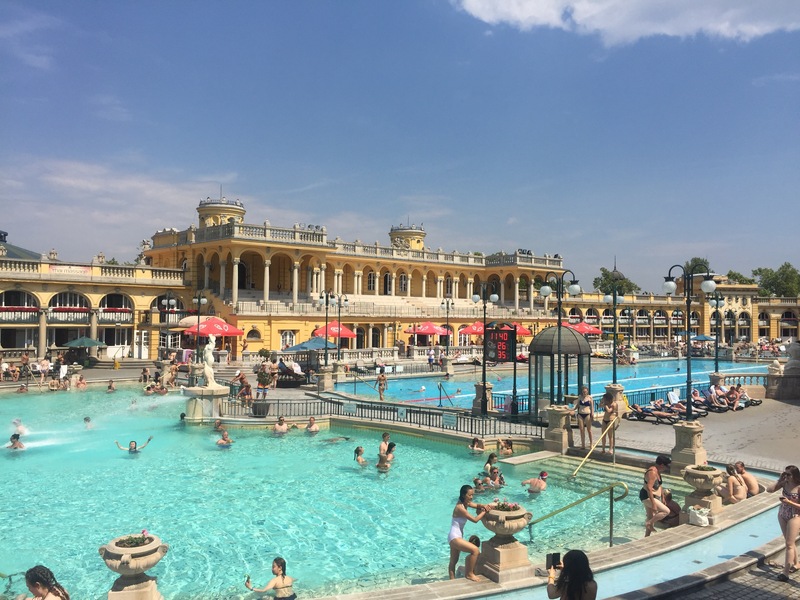 It’s larger than Gellert Spa on the Buda side. It was built in 1909 in the modern renaissance style. We stood in line for the only ticket office open. I must say this is something that could improve in Budapest! The ticket lines can be long and slow. So try and book whatever you can on-line. But once inside it was well organised. You buy your ticket which can be either a locker, or for more money, a cabin. We just got lockers. You don’t really need a cabin to change in. Once again we went off to the male / female change rooms and left our gear in lockers. This time I kept more things with me. Hat, sunnies, cream, towel, swim cap, a little money and my phone for photos. Here is a list of the pools you can visit. Some are indoor, some outdoor. There are heaps of sun lounges if you can manage to get one as well as chairs, a cafe and a constant parade of people from every corner of the world. All traipsing about from pool to pool and some getting burnt! It was hot. We started in the outdoor 30% pool and then the lap pool which was 26%. Then we moved inside and the pools went on from one room to the next. On and on. We tried the 40 degree pool. Sizzling hot! Then into the 20 deg pool. Chillingly refreshing. There are foot baths before entering each pool and lots of saunas and showers you are encouraged to use. It’s such an interesting place. I did not get into this one. Way too many people for me! 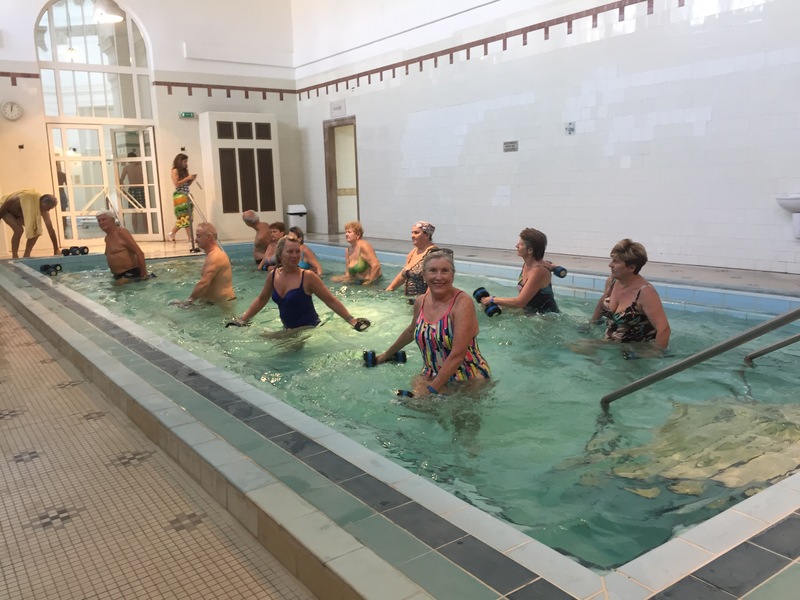 I found the aqua class, which is included in the price and I was encouraged to get in by Christina, a local lady who was just delightful. So there I was doing Aqua with the locals. My Aqua girls at home will be impressed! Christina said she decided to holiday at home this summer and was at the pool most days doing 3 Aqua classes, swimming 2 km, having a massage and sunbathing. Sounds good to me. Christina my new friend is on the left in blue. We had secured a shady spot with a sun lounge and could see the big screen they had up to show the FINA World Cup acitivities. There was the synchronised swimming! Followed by the women’s waterpolo. By now we were in the swing of it and were enjoying ourselves very much. Not quite the beach but pretty good. View from my sun lounge. We had some lunch and finally decided enough. It was hot. So back through the labyrinth of corridors to our change rooms. Not sure how the men handle the change rooms but the women show a distinct range of behaviours. The older women, probably local and the Japanese / Chinese are all walking around in the shower area sans swimmers. Others like the British and American are not quite so … bare. So, freshened up we headed off to walk the rest of the park and down Boulevard Andressy to the House of Terror. Steve had tried to go the other day but the queue was too long. Today very little queue outside so we joined it. As people came out the line was admitted. Inside there was a queue as well – to a single open ticket desk. And the man from the door intermittently yelled move on move on. If only we could! Finally in we went. It had spooky music playing to get you in the mood for the story of Hungary under occupation. First by the Nazi Germans then the Soviets. These poor people endured so much. Communism was a blight they endured after the war , during the Revolution in the 1950’s until finally the Soviest left in 1991. It was an unusual display with the unfriendliest guards I have encountered . At one point we were held in a room with about 8 others and told not to move! We stood there and waited. He wouldn’t answer questions about why we were there. Until finally we were ushered along a ramp into lift …….that moved down slowly enough for the little movie in the lift to tell us how the objectors to communism were hanged. It was quite scary. Finally out of the House of Terror and back to our apartment. I am very pleased not to have lived through that time. Dinner tonight was at Bock Bistro. 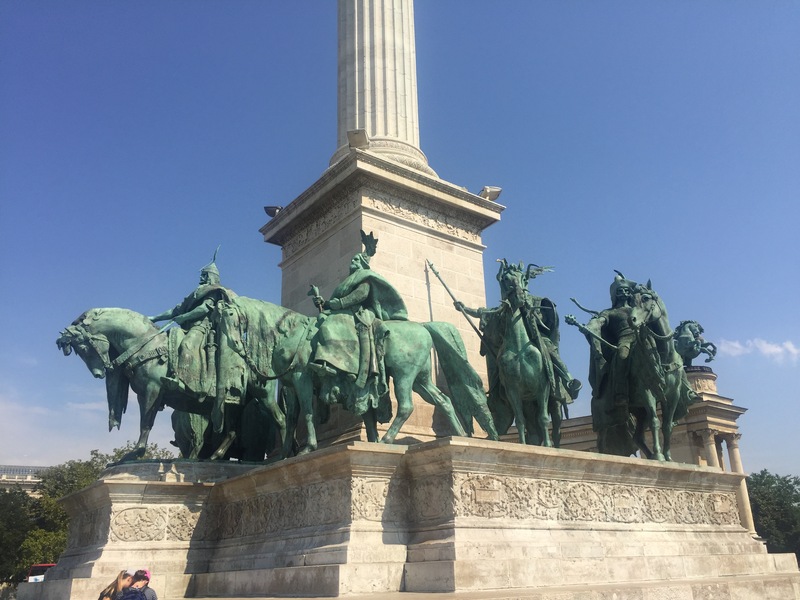 I can definitely recommend it to anyone visiting Budapest. It was great. And no more than 7 mins from our apartment. Thank you Trip Advisor. 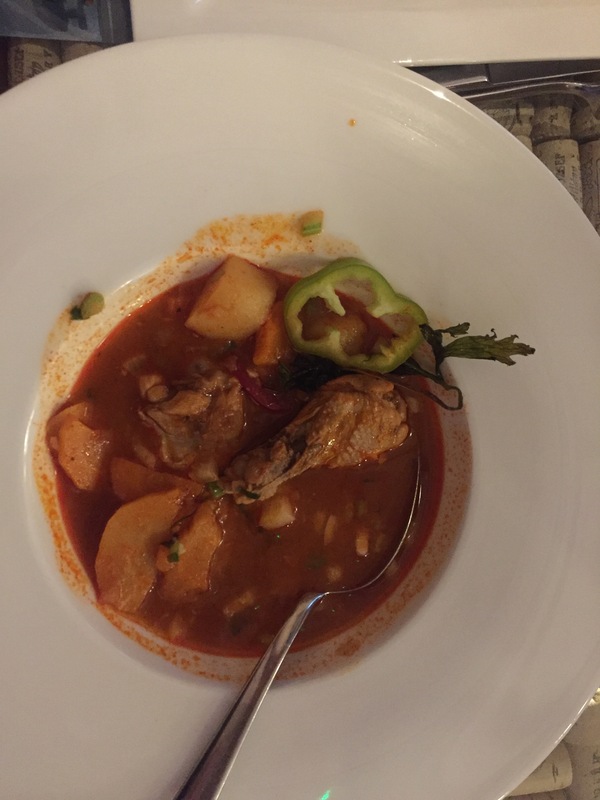 Had to have the local Chicken Goulash. Delicious. And so another day in beautiful Budapest. Tonight we heard from Rob’s friend Pietro. He played with Rob at the Beijing Olympics. He now lives and plays in Italy! He has tickets for tomorrow night’s sold out game – Italy vs Aus! Thank you Pietro. I’m so pleased we had a very special dinner tonight. Tomorrow night it’s waterpolo! My sister and I visited that same spa years ago. 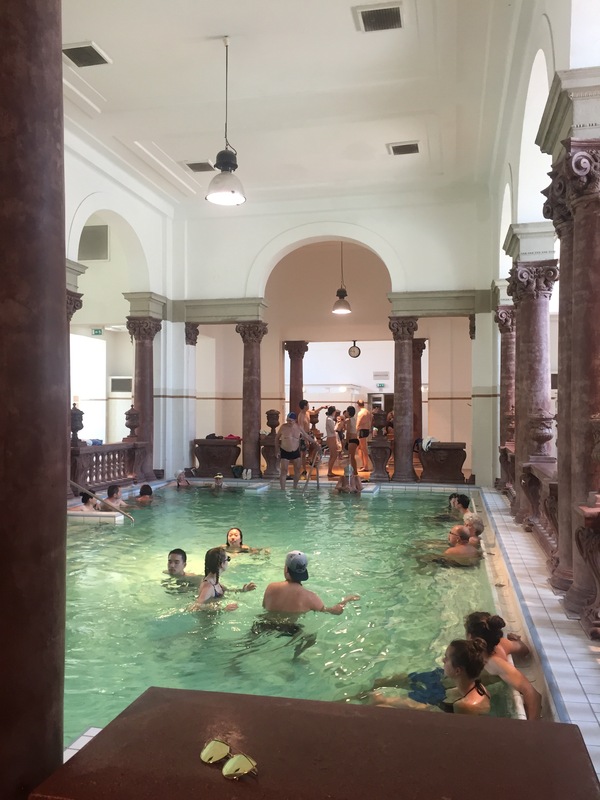 It was the first time I’d ever seen patrons not wearing any bathing costumes- a shock for me initially. Your entire trip to the Balkans has sounded amazing. Your blog’s so well done, I feel like I’ve traveled vicariously with you. 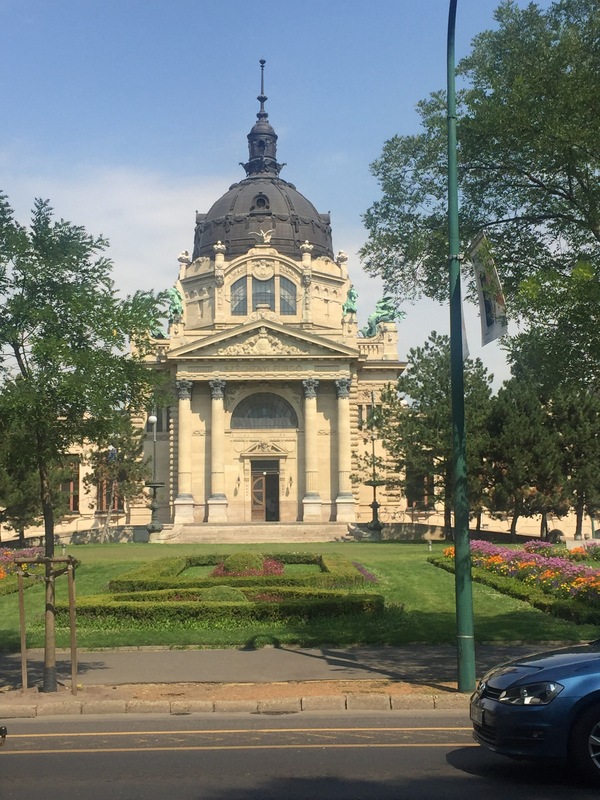 Budapest sounds and looks like such a delight! 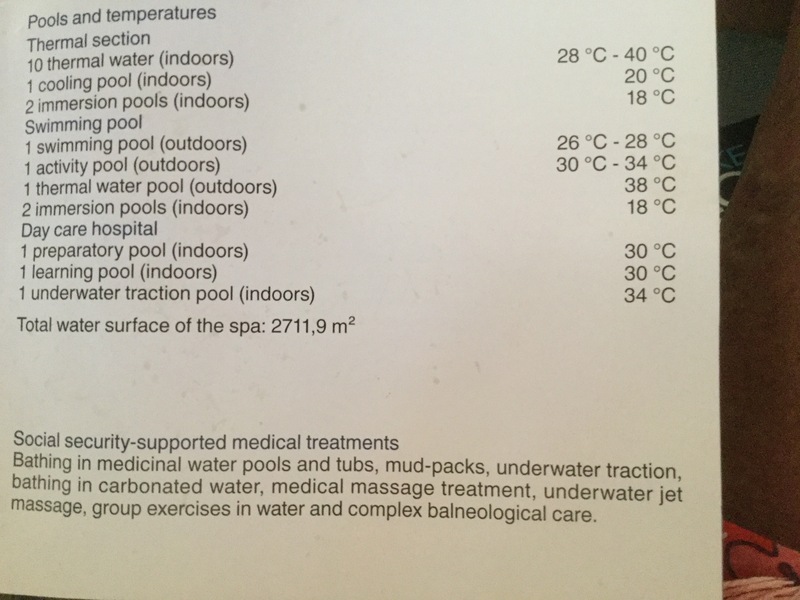 And the spas…I am very impressed with them too. 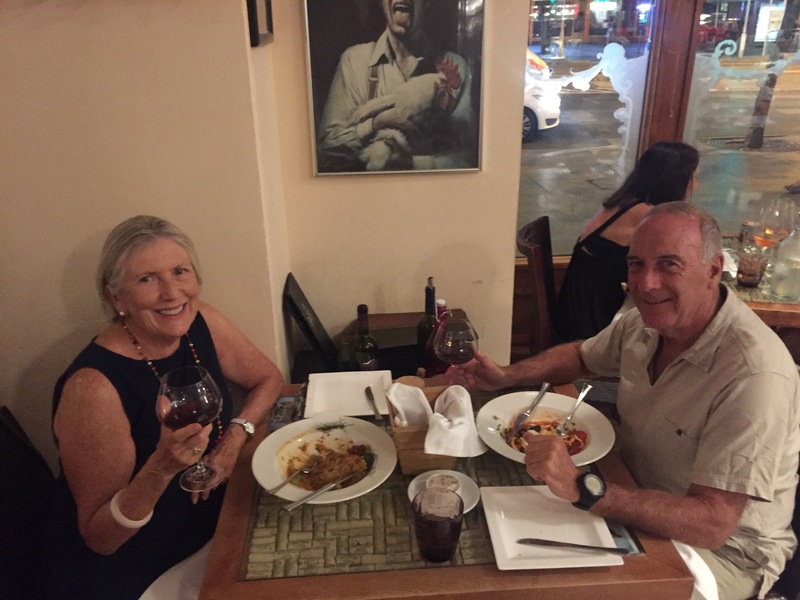 What a great day Fran – from the highs to the lows and back again (dinner)! Hope the water polo was successful – must look it up. I’ve always wanted to visit Budapest and now even more keen to get there. Sounds wonderful.